The Youngstown State University football team never scored 60 or more points against a conference opponent in program history. But with a playoff berth on the line, the Penguins won 65-20 at Missouri State University to lock up their first playoff appearance since 2006. Early in the game, YSU (8-3, 6-2 Missouri Valley Football Conference) moved the ball well on the ground. The Penguins combined for 271 yards rushing by halftime. With 10:50 left in the first quarter, running back Martin Ruiz scored from three yards out to put YSU up 7-0. With 7:57 left in the first quarter, Missouri State (4-7, 2-6 MVFC) was making a deep drive before YSU safety Leroy Alexander intercepted MSU quarterback Brodie Lambert. Missouri State’s receiver bobbled the ball and knocked the ball in the air. Alexander grabbed the ball out of the air while he was standing on the goal line. After the interception, the run game continued to shine. Ruiz and running back Jody Webb combined for 90 first-quarter yards rushing. Youngstown State University running back Martin Ruiz (29) makes a cut while running in the open field. Martin Ruiz scored from the one-yard line with 2:57 left in the first quarter. That touchdown put YSU up 14-0. YSU took that lead into the second quarter. With 14:36 left in the second quarter, YSU defensive end Derek Rivers strip sacked MSU’s Lambert and recovered the fumble. Two plays later, Webb scored on a 52-yard touchdown run to put YSU up 21-0 with 14:04 left in the second quarter. With 10:38 left in the second quarter, MSU kicker Zach Drake connected on a 33-yard field goal to cut the score to 21-3 in favor of YSU. With 5:49 left in the second quarter, Martin Ruiz scored his third touchdown of the game on a 94-yard rushing touchdown. That put YSU up 27-3 after the extra point was missed by YSU kicker Nate Needham. The next play, MSU scored from 63 yards out on a throw from Lambert to wide receiver Zac Hoover to cut the deficit to 27-10. With just four seconds left in the first half, YSU quarterback Hunter Wells threw to wide receiver Alvin Bailey from four yards away to put YSU up 34-10 — that would be the halftime score. To start the second half, YSU’s defense forced another fumble which was recovered by defensive tackle Donald Mesier. Two plays later, Jody Webb scored on a 53-yard rushing touchdown to put YSU up 41-10 with 12:21 left in the third quarter. With 11:15 left in the third quarter, YSU defensive back Kenny Bishop forced a fumble after sacking Lambert, recovered the fumble and scored on a 19-yard return to extend YSU’s lead to 48-10. When YSU got the ball back, they marched down the field to grab a 23-yard field goal from kicker Conner McFadden to put YSU up 51-10 with 1:41 left in the third quarter. With the first possession of the fourth quarter, MSU cut its deficit following an 11-yard touchdown from Lambert to wide receiver Erik Furmanek. The score was 51-17 in favor of YSU with 13:58 left in the game. With 12:05 left in the fourth quarter, YSU running back Joe Alessi scored a 61-yard rushing touchdown, the first touchdown of his career, to put YSU up 58-17. With 7:15 left in the fourth quarter, MSU scored on a Zach Drake 32-yard field goal to put the score at 58-20 YSU. With 6:57 left in the game, Alessi ran for a 75-yard touchdown to put the Penguins up 65-20. While YSU was running the ball against Missouri State, the Penguins were also chasing some records. The team ran for a school record 572 yards and also broke the total offense record with 747 total yards. Also in the record books, 65 points is the third most in school history behind YSU’s 77-13 win over Valparaiso University in 2013 and a 67-13 win over Morehead State University in 2013. Ruiz became the third player in program history to run for over 4,000 yards in their career. His 4,161 yards rushing is second all-time behind Tamron Smith who holds the YSU record with 4,866 yards. 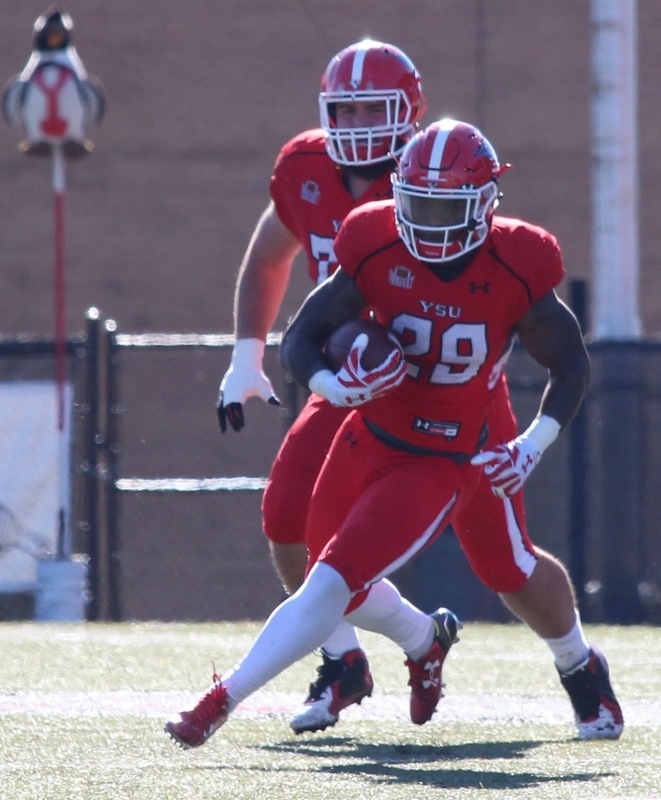 Ruiz also tied former YSU running back Jermaine Cook for fifth all-time at YSU for career rushing touchdowns with 39. Ruiz also became the third Penguin to surpass 5,000 total yards in a career. He currently has 5,053 total yards. Cook holds the record with 5,220. Ruiz is only behind Cook and Smith in the record book. Wells completed 15 of 16 passes on Saturday for a 93.7 percent completion percentage, second highest among YSU quarterbacks with a minimum of 10 attempts in a game. The only Penguin with a better completion percentage was Jeff Ryan in 2000. He completed a perfect 10 for 10 day against Indiana State University. 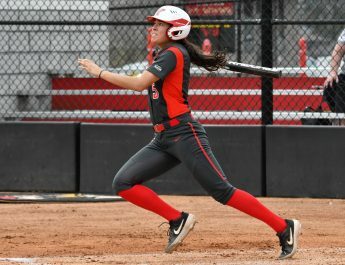 YSU will find out its spot in the playoffs and its opponent on Sunday. The selection show will air at 11 a.m. on Sunday. Rushing_YSU, Joe Alessi 7-190-2. MSU, Brodie Lambert 13-57-0. Receiving_YSU, Jody Webb 4-49-0. MSU, Zac Hoover 2-63-1. Sacks_YSU, Kenny Bishop 1, Derek Rivers 1, Jameel Smith 1. Tackles_YSU, LeRoy Alexander 7-4-3, Avery Larkin 7-4-3, Cody Squiric 7-2-5. MSU, Dylan Cole 16-6-10.